Full documentation for Classic VPython, including tutorials and reference materials. This documentation is included with VPython installers and is accessible from the Help menu in the VIDLE program editor. Here is full documentation for the older VPython 5. 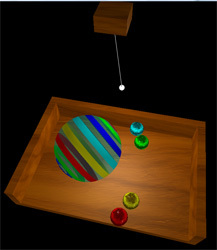 A simple example of a bouncing ball. For experienced programmers new to Python: How Python is different from languages you may know. Erik Thompson's video introduction to VPython. The cT archives: a programming language that was superceded by VPython.